Notes: October 1997 - The tree consists of a central stem surrounded by 6 others which lean outwards. These individual trunks are up to 16' in girth. 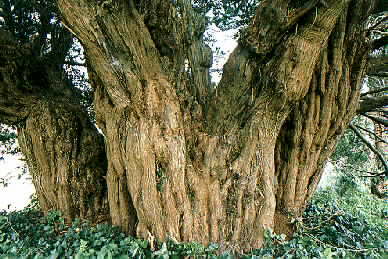 Latest information: 23rd June 2014 Peter Norton: The male yew grows up through the barrow opposite the southeast corner of the church. It is comprised of a central stem with six others in a circle leaning away from the centre. The area around the base of the tree was checked for evidence of seeds but none were observed with only dried remains of the male pollen sacs noted. The central stem does not appear to be hollow, but the other six areas of growth are taking on the classic horse shoe shape. The north side of the tree is free of summer vegetation, however this cannot be said of the south side where ivy made accurate recording impossible. A girth of 40' 4'' at a few inches from the ground was recorded.